Theme parks are a consistently strong and profitable global market. According to an extensive report by the International Association of Amusement Parks and Attractions (IAAPA), as of 2016, the amusement park market was increasing at a rate above 5%. Over the past 5 years, the market has increased 60% faster than the annual increase in nominal GDP. Despite fluctuations in the global economy and competition from new forms of digital media that have impacted other entertainment markets, theme parks continue to attract millions of visitors a year. Theme parks and amusement parks provide an in-person, immersive experience that can only be attained by physically attending a park. Since visitors are seeking a distraction from every-day life, it is critical that theme parks stay one step ahead of consumers and anticipate their needs and desires. While amusement parks must focus on the managerial aspects of maintaining a park, perhaps more important is the need to accommodate every need of the visitor in all aspects of the park. 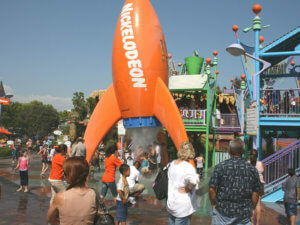 Theme and amusement park revenue is generated from several types of sales. The first and most important is ticket sales, which generates 55-60% of total revenue. Food and merchandise sales account from 25-30% and the remaining 10-20% is created from licensing, sponsorships and hosting special events. Since ticket sales are the main source of revenue for a park, theme parks cannot afford to lose out on valuable season or one-time ticket purchasers. A park can have groundbreaking rides and attractions, but if the guest does not feel comfortable and attended to, they will not stay, nor will they return. One significant challenge for theme parks is keeping guests comfortable in inclement weather. Since many theme parks garner most of their business in the summer, heat is a major factor in identifying and developing guest comfort strategies. Theme parks must consider the areas where guests gather such as traffic areas, lounging areas and restaurants and ensure that they are kept cool. Many parks have installed shade covers, but these are not always enough. Including misting poles, patio misting and fogscapes in common areas can be an efficient solution.